Here's a hand beaded collar that's a chunky different twist on a Victorian favourite. 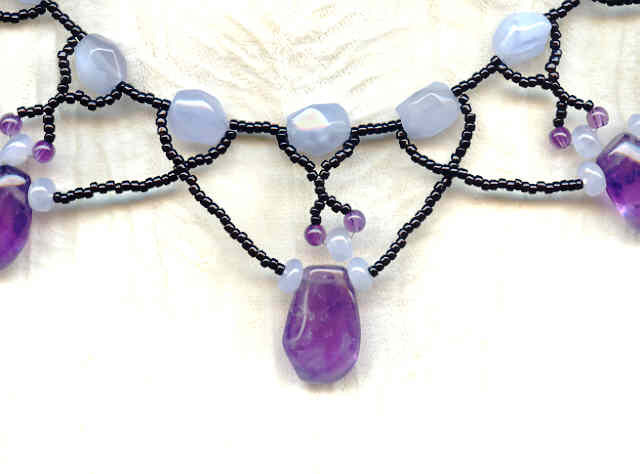 The sky blue chalcedony is highly polished and sets off the rich dark purple amethyst nuggets beautifully. 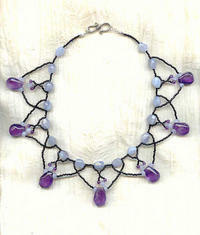 I've used jet black seed beads to weave the larger beads together; I think it adds a touch of drama. With its dangles and drops, the piece has a vaguely medieval look to it; VERY feminine, VERY romantic. One can just imagine Lancelot clasping it about the neck of the Maid of Astolot. The collar is about 17 inches long and closes with a sterling silver 'S' hook. It's another unforgettably feminine necklace from SPARKLE PLENTY.